The Blob: this name may conjure images of a 1950s horror film antagonist. But in 2015 the Blob referred to the Pacific Blob—a massive algae bloom off the West Coast of the United States that produced toxins harmful to aquatic life.These blooms are not unique to the Pacific Ocean—large blooms have appeared in China, Russia, and Florida over the past year. Russia’s algae bloom is especially critical, as it is disrupting a lake that holds 20% of the world’s unfrozen freshwater. Through disrupting the balance of ecosystems and degrading drinking water quality, algae blooms negatively affect human health and the water-related economy from seafood sales to water recreational activities. Because of their potentially devastating consequences, it is important to understand why algae blooms occur and how to prevent them. “Algae bloom” is something of a misnomer. The bloom could consist of algae or a type of microbe called cyanobacteria, and many of the algae blooms that are considered harmful are actually blooms of cyanobacteria. Although cyanobacteria can sometimes be harmful in bodies of water, they are incredibly important for our world’s ecosystems—they produce a large fraction of the earth’s oxygen. Similar to trees and other plants, cyanobacteria consume carbon dioxide in the atmosphere and release oxygen when they are growing on the water’s surface. In fact, cyanobacteria are responsible for first providing this world’s atmosphere with oxygen, a process that started about 2.3 billion years ago. An algae or cyanobacteria bloom is a rapid increase in and overabundance of algae or cyanobacteria in a water source caused by high concentrations of the nutrients nitrogen and phosphorus. These substances are food sources for the green guys. After the algae or cyanobacteria consume all the available nutrients, they die. The dead cyanobacteria or algae, now full of nutritious nitrogen and phosphorus, are consumed by bacteria already present in the water. As the bacteria eat the algae or cyanobacteria, the bacteria also consume dissolved oxygen in the water that other organisms—like fish—need to breathe. If the water has too little dissolved oxygen, it becomes an unlivable environment, driving all life from it. Image credit: Nicole Repina, BSR Design Team. The high concentrations of nitrogen and phosphorus that cause blooms often result from agricultural field runoff. Nitrogen and phosphorus are very important elements in life: humans need them, plants need them, and cyanobacteria and algae need them. As a result, nitrogen and phosphorus are key ingredients in agricultural fertilizers to help encourage crop and plant growth. When a farmer applies fertilizers to a field, rain or watering often washes it into nearby lakes, rivers, and streams. These elements accumulate, creating a feeding ground for algae and cyanobacteria. Another misconception about algae blooms is that the algae or cyanobacteria are inherently toxic—you may hear the phrase “toxic algae blooms”. Some species of algae and cyanobacteria produce toxins, and while the algae are effectively removed by your local water treatment plants, these produced toxins are sometimes not removed. Currently, this issue of removing the toxins from water is being researched; ozonation of water has proved effective in some cases. As climate change continues to alter our world, one of the negative effects could be an increase in the number of algae blooms. With climate change comes harsher rain storms with larger volumes of water, which will increase runoff from agricultural lands into water sources. As a result, there will be more nitrogen and phosphorus in the water, leading to more, and perhaps larger, blooms. In addition, warmer temperatures encourage the growth of the more harmful (toxin-producing) strains of algae and cyanobacteria. Time will tell how dire the algae bloom situation will become. To best prevent harmful blooms, we need effective solutions to regulate agriculture fertilizer usage to prevent farmers from applying fertilizers before rain events, methods to prevent major runoff from crop fields, and methods to remove nitrogen and phosphorus from water sources. Preventing algae blooms is one way to combat the negative effects of climate change, thus helping to preserve our freshwater and marine ecosystems. 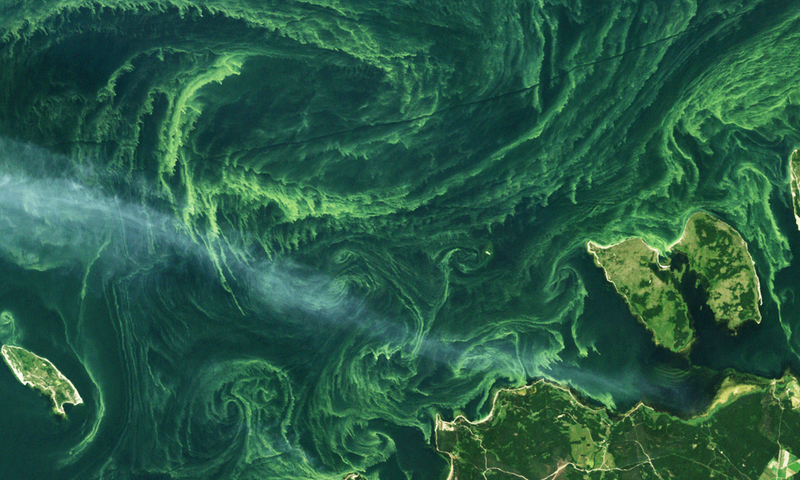 Featured image credit: Algae Bloom by Mapbox via Flickr.